00dozo: Gosh, I recall reciting that as a kid in school. Quirks: And so should we all be. Too often we take the efforts of our soldiers - past and present - for granted, don't we? Me too, for a few years during grade school. They actually have poppies here, but I can never seem to find them or see anyone handing them out. Do they still recite that poem at the ceremony on Parliament Hill?? And I believe that part the poem was printed on the back of the $10.00 bill at one point. 00dozo: Yep, you're right about the $10 bill and it's actually sung at the ceremony at the War Memorial in Ottawa. Also, the line "To you from failing hands we throw / The torch; be yours to hold it high" is the official motto of the Montreal Canadiens. It was written on the wall of the team's locker room at both the Montreal Forum and the Bell Centre. Thank you Wikipedia! Veterans Day is something that we should always acknowledge. My whole family has been military for generations. My husband retired in June of 2009 after 25 years in the Air Force, part active duty, and part Reserves. I'm giving him some tonight. Poppies! I wouldn't get that reference if I wasn't half British. I learned only yesterday that they're also a national symbol in Canada. We owe a might big debt to all the soldiers who've fought for God and country over the years. 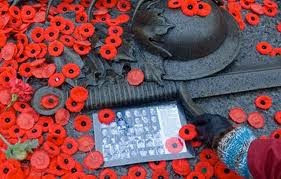 Mike: Big todo this year over the government's intention to levy a controversial tax on poppies that veteran sell. I mean, c'mon. Anji: You've got that right.